You would then receive either MySQL 5.5, 5.6, or 5.7 depending on which distro you were using, but they were all versions of MySQL. However, with Debian 9, if you do this you will end up installing MariaDB 10.1 which is a drop in replacement for 5.6. If you really want MySQL instead of MariaDB for whatever reason, you can execute the script below to install the version you want. At the popup-page, select the version you want. 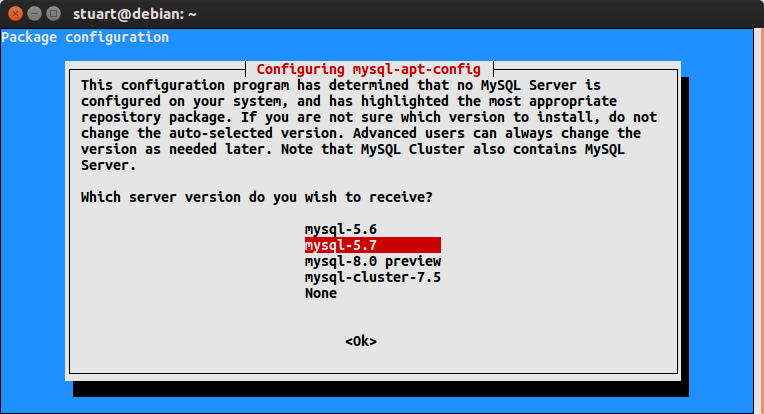 Then use the following commands to install the MySQL server (it will install the version you selected).